Pearls come in a bewildering variety of shapes, colours and sizes. Round pearls traditionally command the highest prices but it's worth remembering that wild pearls were rarely round. Different shapes can give you a lot of pearl without breaking the bank. Choosing a colour is largely a matter of skin tone and personal preference. Classic white, ivory and cream are usually a safe bet. Round Pearls are rarely perfect spheres unless they are of gem quality or imitation. The longer the pearl remains within the oyster or mussel the more chance there is of it developing an irregular shape. Contrary to the images portrayed in films very large round pearls are uncommon - and expensive. Even pearls nucleated with a shell bead have a hard time keeping their shape as they grow. The term off-round is used to describe pearls which are 'roundish' to the eye but have a slightly oval or flattened shape. They can still have excellent qualities in terms of lustre or lack of blemish. Many people think of an oyster or mussel producing one pearl. In fact a mollusc may create over a dozen pearls depending on how it is seeded. Some of these are button pearls, so-called because of their shape - round on one side and flat on the other. Though unrelated to button pearls, America once had a thriving industry producing mother-of-pearl buttons for coats and jackets. Plastic killed the industry but American mussel shells are still exported to Japan for nucleating seawater pearls. Oval Pearls are sometimes known as rice pearls. It comes from the very early days of Chinese freshwater pearl production when large numbers of low quality pearls entered the market and were derided as 'rice-crispies' after the cereal. Oval pearls can form when two pearls in the same mollusc join together. Biwa Pearls were so named because they came from Lake Biwa - a large freshwater lake near Kyoto in Japan. This was once the focus of the Japanese freshwater pearl industry. In the 1980's pearl production ceased due to industrial pollution but Biwa became a generic name for all freshwater pearls regardless of their shape. The pearls shown here are also called stick pearls. Pearls come in a variety of colours. Natural colours are mainly down to to the breed of mollusc. Other influences include diet, water temperature and pollutants. No-one can predict or control what colour pearls will be produced in any hatchery. Black pearls are rarely jet black but blue, green, silver, grey, aubergine, copper, peacock and more. Green is the predominant colour. Naturally coloured black pearls come from the pearl farms of French Polynesia (Tahitian pearls) as well as Indonesia and the Phillipines. Except for freaks, there are no natural black freshwater or Akoya pearls though these may be dyed or irradiated to simulate black pearls. The majority of 'black' pearls are treated in some way - it doesn't harm the pearl. 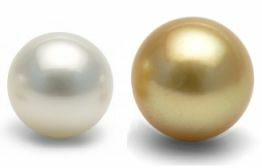 The most common terms used to describe the colour of a pearl are body, overtone, and orient. Body colour is that seen when you look directly at a pearl. In Akoya and freshwater pearls it's typically white or cream. Overtone is a translucent (semi-transparent) layer that covers most or all of the body. It may be rose, pink, silver, peach, lavender or other shades. Sometimes (especially with Akoya pearls) the overtone is artificially created. Orient is a shimmering, rainbow effect moving across the pearl surface. It's like the colours you see on a large, transparent, soap bubble. The GIA (Gemological Institute of America) publishes charts illustrating various pearl shapes and colours. It could do with some updating. Baroque is a general term for pearls with an irregular shape. Most natural (wild) pearls are baroque. Bead nucleated pearls (pearls seeded with a round shell bead) may develop a tail on one side. The most valuable baroque pearls are South Sea and Tahitian. Due to the length of time under cultivation a high percentage of the pearls harvested are baroque. Keshi pearls are accidents which happen when the mollusc rejects the nucleus and grows a 'free form' pearl. Purists debate whether Keshi (or Keishi) pearls should be considered natural pearls or not. 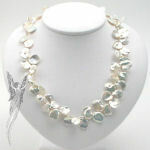 Keshis are sometimes called 'flower petal' pearls and are known for their shimmering lustre. The world's largest, most expensive, and most desirable white and golden South Sea pearls come from the waters of Australia, Indonesia and the Phillipines. Attempts to cultivate them outside their native areas have met with little success.